As the highly profitable iPhone makes up an increasingly larger proportion of Apple’s sales, the overall gross margin would be expected to grow. Sure enough that’s what’s been happening. The gross margin percent, which measures the direct or variable costs of production vs. price, shows a healthy rise in the last five years from slightly below 30% to around 40%. The Operating Margin, which also includes the overhead or fixed costs like R&D and SG&A, shows a similar rise, reaching about 30%. Margin expansion while sales quadruple is a good indicator that a company is producing real value not just trading sales volume for profit. Focusing attention on individual product lines, it’s clear that the iPhone is the largest component of sales and of profits. We don’t have specific product line-item gross margins from management, but we can estimate a figure for the iPhone by several means. First, we can work out roughly what every other product line’s margin is due to their longer histories. (Mac and iPod have reliable profitability estimates). What’s left can be deduced to make up the iPhone’s margin. Alternatively, we can get estimates of the bill of materials and add in some of the other direct expenses like manufacturing, warranties, shipping and incidentals to get an estimate of the cost of production. Overall, gross margins have reached over $10.3 billion in the quarter, increasing 543% from five years ago and 61% from a year ago. That’s great, but by knowing product line profitability we can get a better feel how the company changed strategically. In the following chart I show the percent of gross profit captured by each product line. 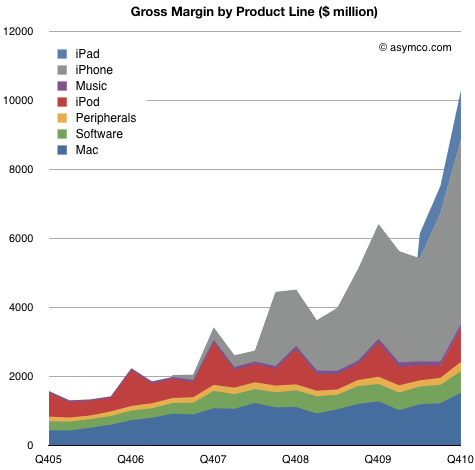 What we can observe is that at the end of 2005, OS X based products made up nearly half the profits. The rest was mostly the iPod, which was not a software platform product. 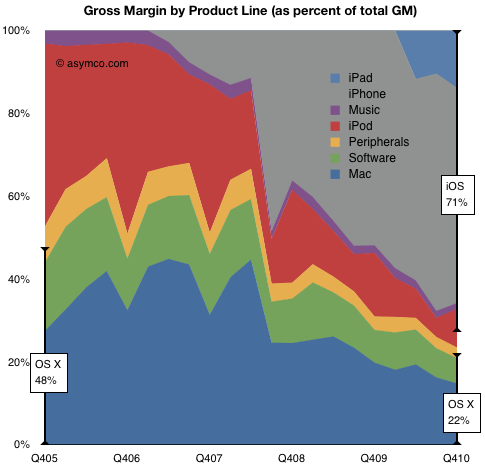 A short five years later, OS X products which, although having grown in volume, made up only 22% of total margin. The rest was mostly iPhone but with significant contributions from iPad and iPod. What’s most important to note is that the non-OS X profits are almost all powered by iOS. iOS powers about 70% of Apple’s current gross profits. Combined with OS X, 93% of profits are from platform products. So again the question about Apple being a software, hardware or media company comes back. Perhaps, those categories are not relevant. Perhaps Apple is a platform company. ‹ Previous Post Is Apple a candidate for acquisition? › Next Post Hyvä Suomi! O Canada!